Haikyuu!! : Lev Kenzan! tells an original story that reveals "a surprising side of a popular player." Haikyuu!! : Lev Kenzan! (ハイキュー!! リエーフ見参！) was screened at Jump Festa 2014 on November 9, 2014. The OVA was later bundled with the 15th volume of the manga, released March 4, 2015. If you've ever wanted to know more about the Nekoma volleyball team, or want to watch a less volleyball-centric episode about the Karasuno team, these OVAs are for you. Be warned that watching the second OVA may spoil an episode or two of the second season for you. Overall, I'd say the second OVA would be worth about 7/10. The OVA's art was slightly inferior to the anime's, however it still looks fine and was animated well. As long as you aren't expecting anything special, the art will be satisfactory. There's not much to say about the sound other than that it was about average for Haikyuu!, nice but nothing special. I love Haikyuu in general, so as I wait for the third season to be released, this was a fun watch. As far as OVAs go, this one was pretty good. I'd recommend it to any fan of Haikyuu!!. This OVA was pure class. I love EVERYTHING about it, especially the ending when Ukai yells at all of them to go home. In the space of twenty-something minutes, we get character development between Kenma and Lev, although that's to be expected of Haikyuu. A class OVA from a class anime. Overall, I give this a 10. Well, I'm always gonna give Haikyuu!! a 10. So, this OVA is mostly about Nekoma. Unlike many of the OVAs I've seen for other anime, this OVA actually hinges on character development. If you've only seen the first season of Haikyuu!! at this point, this episode will introduce you to Nekoma's new player Lev Haiba. It'll take you through his struggles in trying to become Nekoma's next ace and how hard it is to sync with Kenma. Let's get the basics out of the way. The sound is always brilliant. The voice acting in this anime is nearly second-to-none. I really love the art style of this anime, as well, so obviously that's a plus. Here's why I really love this episode, though: Nekoma is a fallen powerhouse, just like Karasuno. 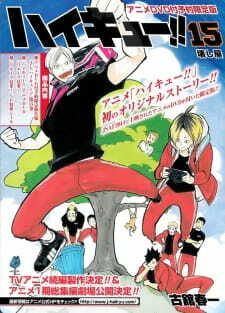 However, we don't really get to see a lot of Nekoma unless we're seeing them as a strong team. It was nice to see them struggle to stay cohesive in this episode. It really solidified them as Karasuno's rival as well. Lev as well as Kenma got some character development in this episode which was done really well. Kenma coming to a new conclusion about being a setter through Lev's inexperience was really nice. Overall, I think this episode sets a nice tone for the Nekoma-Karasuno battle that will take place in the future at the training camp and beyond. We see Karasuno practicing and improving all the time, so I really loved seeing that from Nekoma as well.